I've not posted a wishlist in forever, so it seemed only fitting that I did one. After all, there's never a time where I don't want anything! 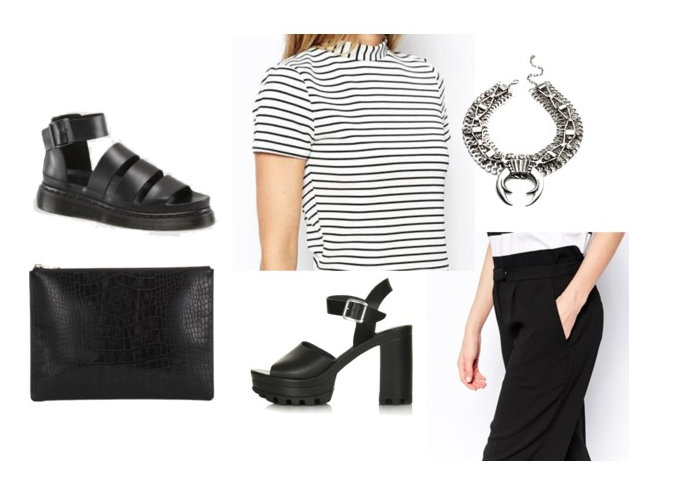 This one sees my usual monochrome theme, with chunky sandals (from Dr Martens and Topshop) and textures thrown in. I actually think it'd be a perfect outfit (if I had four feet.) I've become a real trouser person of late and these ASOS cropped trousers seem like they'd go with everything and I've got a high neck top from there that would turn it into a great two piece. I love the back of the striped top too, (click through to view on ASOS) and despite not needing another stripy top, I know this'll be mine very soon. Lastly the perfect Dannijo necklace that has been on my mental wishlist since I was about 15. Such a statement and very fitting with my penchant for large necklaces. I love the dr martens sandals, I've been wanting some for such a long time, if only I could afford them! I love monochrome! I've recently bought the Topshop Lenka heels and they feel so comfy!! I love all these pieces, the docs are soo nice!